Like most areas in Chennai today, East Coast Road (ECR) has seen a surge in its development over the past ten years. The stretch is undergoing a further expansion that will see it connect to Mahabalipuram and a total length of 113 kilometers. The fact that ECR connects very well to many prime locations in the city makes it a residential hotspot for many solo-livers and families alike. Real Estate projects are popping up left, right and centre, giving more than enough reason for potential homeowners to consider ECR as their home of choice. One of the most promising soon-to-be-launched real estate project is Casagrand’s ECR14. Having already established itself as a big player in premium housing projects across prime locations like OMR, Alandur and Thiruvanmiyur, Casagrand look to make ECR its latest foundation for high-rise apartments. So, if you are planning a move to ECR, here are a few reasons why Casagrand’s ECR14 will make the perfect home for you. Infrastructure and spacing were done with great care to ensure that every resident is able to make their very own personal space with ease. Everything from the lobby to the houses and even the external amenities are built with the right amount of spacing to give its residents a comfortable living atmosphere. Whether you enjoy filling up your home with elegant decor or prefer to keep things minimal, ECR14 is open to every lifestyle choice. Looks matter, even in the case of the apartment you are living in, and with ECR14 you will get a treat for the eyes with well a well-landscaped podium and swimming pool. Annual and festive events can be conducted in full glory with a podium that provides optimum spacing and is located in the right place for everyone to catch a glimpse of the occasions. A swimming pool that is cutely shaped will keep the family entertained and relaxed at all times. Wide open spaces in common areas bring about a greater social interaction between neighbours. ECR14’s layout is built to give its residents maximum open areas on the ground and in the lobbies. Be it group jogging sessions or movement of big goods in and around the complex, ECR14 makes sure you get all the breathing space you need. For anyone who is looking to buy an apartment, one of the biggest reasons to move for purchase is living near prime locations in the city. Staying true to its name ECR14 is right in the heart of the stretch, making travel to prime areas easy for its residents. In the mood for a walk on the beach? Looking for the good education for your children? Everything from ECR14 and back is well connected to make your trip shorter and sweeter. No matter which floor you’re on, it always feels great to have a refreshing wave breeze constantly flow through your home. With ECR14’s well ventilated building structure, keeping cool is guaranteed 24/7. With open balconies, breeze greets you every morning like a best friend, keeping the atmosphere at home ever-pleasant. Want a great view? You’ve got that with ECR14! Most of all the apartments are angled to face the beautiful beach, giving your senses all-round entertainment with the sights and sounds of nature’s finest. It stays true on every floor as well, with the height proportions making for an uninterrupted view on every floor. Fun days out are guaranteed by the fact that ECR14 is built right behind Mayajal. All your plans for a weekend movie or a gang-up for fun times will be sorted out in a mere five-minute walk to the multiplex giant. Are you a fitness freak who loves to sweat it out in the gym? Enjoy a good round of badminton with peers? Need electricity all the time? Whatever your wish be, ECR14 will grant it, as it has all the amenities benefiting individual lifestyle choices. Nothing makes living in an apartment complex better than living within a society of like-minded individuals. Among the many apartments in ECR, ECR14 gives you the largest community of such individuals in a 7.14 acre stretch of 410 apartments. It truly feels like living in a new, different world altogether. 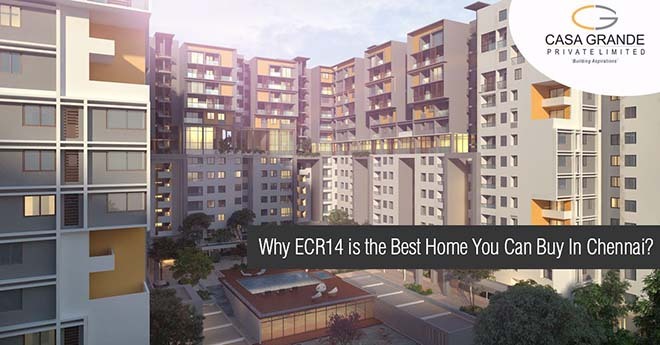 High rise at ECR14 is defined by its 14-floor stilt-supported structure. Sturdy as it can be and adapted to any weather, the apartment complex brings quality high rise living in every aspect. The stilts open an additional space for parking and general storage.